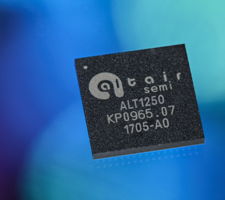 Hod Hasharon, Israel, Feb. 5, 2019 /PRNewswire/ -- Altair Semiconductor, a leading provider of cellular IoT chipsets, announced today that its Cellular IoT chipset – ALT1250, is now featured in more than 10 modules, with tens of design wins in IoT applications such as smart meters, vehicle telematics, wearables and trackers. Moreover, the company sees significant growth in its IoT chipset shipment volume, expecting to ship millions of units throughout 2019. "We have refined our cellular IoT chipset – the ALT1250 – to answer all the needs for low power IoT devices, including immediate availability for designing and launching IoT devices in the market," said Oded Melamed, CEO of Altair. "Our proven, industry-leading combination of low power consumption, small size and security features adds up to a smart solution for manufacturers who are ready to deploy IoT products today." "Our highly integrated ALT1250 makes device designers' lives much easier, in terms of effort expended, time-to-market, expertise needed and overall cost of offering IoT solutions today," added Melamed. "In addition, the ALT1250's OneSKU™technology means the chipset is available globally on all frequency bands, including in advanced markets such as Japan, Korea, Australia and the United States." Altair Semiconductor, a Sony Group Company, is a leading provider of LTE chipsets for IoT. The company's flagship ALT1250 is the smallest and most highly integrated LTE Cat-M and NB-IoT chipset, featuring ultra-low power consumption, hardware-based security and a carrier-grade integrated SIM. Altair partners with leading global vendors, including G+D (Giesecke+Devrient), HERE Technologies, Murata, Sierra Wireless and WNC, to provide low-power and cost-efficient modules for a range of industrial and consumer IoT applications such as trackers, smart meters, wearables and vehicle telematics. Altair's chipsets have been commercially deployed on the world's most advanced LTE networks, including AT&T, China Mobile, KDDI, Softbank, Verizon and Vodafone. Mini ITX Motherboard features Intel® Q77 Express chipset.